Apple never failed to follow the trend. There’s a lot of real estate to fill on the iPad Pro’s 12.9-inch screen. Just like the GoPro Hero4 Black allows you to record at up to 4K resolution at 30 frames per second. It is the first camera of its kind to feature ultra high-resolution, high frame rate video as powerful as this. So you can play GoPro Hero 4 Black 4K videos on iPad Pro and make the most of the more than 5 million pixels on the iPad Pro’s screen. Take it easy. Here we’ll introduce an easy solution to play GoPro Hero4 Black recorded 4K videos on iPad Pro. Pavtube Video Converter Ultimate is a simple-to-use yet powerful tool that helps convert GoPro 4K videos to iPad Pro, which can give you a big hand. Overall, this video converter works as the best GoPro video converter. With it, you can easily resolve two basic issues: Convert GoPro MP4 video to a more compatible format for iPad (It comes with the optimal presets for iPad 2/3/4/5, iPad Air, iPad Mini 4/3/2/1); tweak GoPro videos’ resolution, bitrate, frame rate to fully fit your iPad device. And then add the formatted GoPro videos to iPad Pro form computer for playback. Plus, this video converter app is built with a video editor, which allows you to trim, crop, adjust effects, insert subtitles, etc… Here is review. iMedia Converter for Mac is a helpful app to encode videos for further usage (including El Capitan). Step 1. Import GoPro 4K videos/media files & Discs. Click the top left icon to import Blu-ray/DVD disc, folder, IFO or ISO files; click the second icon to add video files. Or you can drag and drop videos to it directly. Step 2. Choose a proper format for iPad Pro. 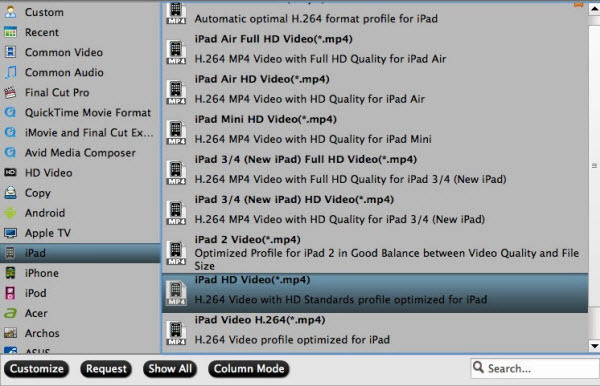 Click “Format” drop-down list and choose “iPad > iPad Full HD Video(*.mp4)” as the compatible MP4 preset with best video quality. Or you can choose other presets if you don’t need full size videos. Step 3. Customize video specs for iPad Pro(Optional). In the Video Settings, you can select Encoder, Frame Rate, Resolution (you could define it yourself according to your iPad Pro tablet) and Bitrate for your movie. To down-convert ultra HD 4K to 1080p, do remember adjusting video size to 1920*1080. That is the exact 108p. Step 4. Start GoPro 4K Videos to iPad Pro Conversion. You can hit the big red “Convert” to start converting 4K to MP4 with best video settings for iPad Pro. After the conversion, click “Open output folder” in the conversion window, or “Open” in main interface to quick locate the converted video and copy to iPad Pro via iTunes. 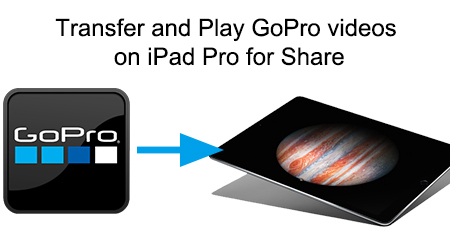 Now, you can transfer GoPro 4k videos to iPad Pro via Windows 10 for smooth playback without any problem. How to Import a DVD to play on iPad Pro?